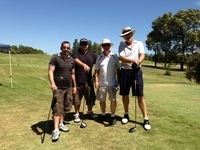 The great weather boded well for all teams at The Vines Resort & Country Club for the 2013 AHA Coca-Cola Amatil Golf Classic on Tuesday 26th February. 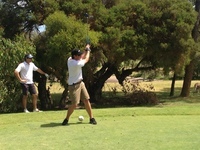 Congratulations to all participants who helped make the 2013 AHA Coca-Cola Amatil Golf Classic Day a great day for the hotel and hospitality industry. A very special congratulations to the winning team, The Quarie Bar and Brasserie, who prevailed in the heat over the other teams at the 18 hole sold-out ambrose event. The 2013 AHA Coca-Cola Amatil Golf Classic concluded with award presentations over a rotisserie banquet with gourmet pizzas and beverages. **The scores for the winners and the runners up were the same however the 2nd place team lost on countback.